Spend a leisurely hour at your local commercial bookstore and you won’t be able to avoid seeing vampires. Just yesterday I noticed that a neighborhood bookstore had an entire section entitled “Teen Paranormal.” Zombies also continue to grow in popularity, now having their own line of undead Christmas products. And where is the humble werewolf? Not gone, just lurking in the shadows. This weekend I finished the third werewolf book by my one-time co-Wisconsinist, Linda S. Godfrey. (She’s still there, but I’m not.) 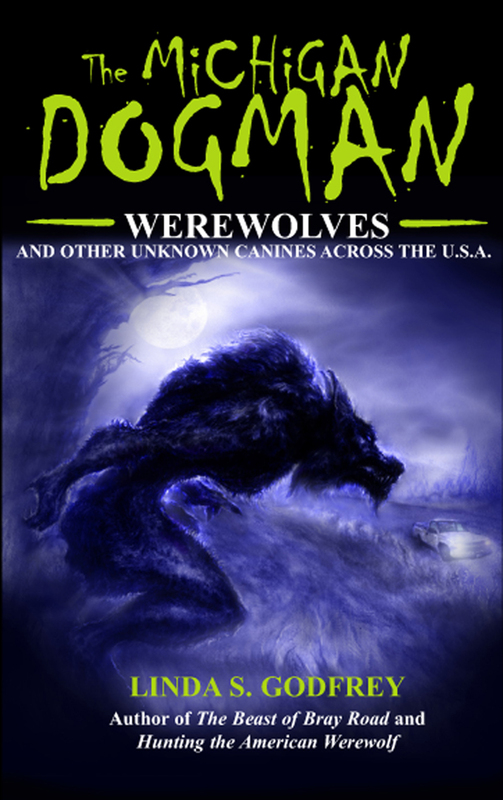 Lest any of my readers think I am casually lumping her work together with the fictional fantasy monsters, I must declare up front that The Michigan Dogman is not a work of fiction. Linda is a careful researcher, a former journalist, and a woman who possesses something many researchers lose over the years: an open mind. The problem with occasional phenomena is that they are almost impossible to test in any empirical kind of way. Since even before the Beast of Bray Road story broke in 1992 occasional reports of bipedal canines had stumbled into the news once in a while, causing headline-happy journalists to push the werewolf button. Underneath the current monster hype, however, is an intriguing question of origins. Where do all these similar stories originate? While not even close to the number of reported Bigfoot sightings, the dogman/manwolf sightings that Linda has pulled together are impressive for their overall uniformity. Witnesses who’d never heard of the creature repeatedly report fine details that mesh with accounts of individuals otherwise unconnected. The standard answers of hoaxes and misidentifications just don’t cover the three volumes worth of material she had compiled. Few would stand by the assertion that these are shapeshifting humans, but for those with an open mind the werewolf trilogy gives pause (paws?). The universe is large beyond human comprehension. Simply because we’ve evolved very complex brains doesn’t mean we’ve found all the answers. I’ve never seen a werewolf or any other popular cryptid. But having studied the strange world of religion all my life, I know better than to declare, ex cathedra, that very strange things cannot exist. This entry was posted in Animals, Books, Monsters, Popular Culture, Posts, Science and tagged Beast of Bray Road, dogman, Linda Godfrey, Michigan Dogman, Teen Paranormal, werewolf by Steve Wiggins. Bookmark the permalink. Thanks so much for the accurate analysis, Steve, I think you nailed the true gist of it! Thanks for stopping by, Linda! Hopefully a few readers will pick up your book(s) and see for themselves!